A former Algonquin chief and elder is being remembered as an important figure for First Nations people both locally and abroad. William Commanda died on Wednesday at the age of 97. Commanda was the chief of the Kitigan Zibi First Nation near Maniwaki, Que., from 1951 to 1970 and later embraced his role as an elder and spiritual leader. 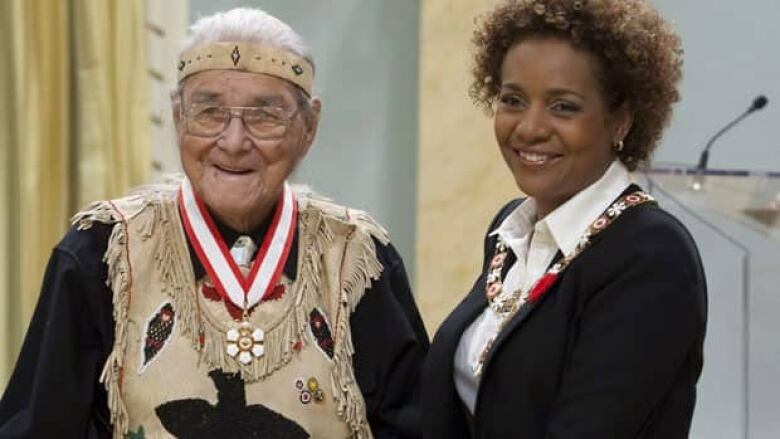 "He was a gift to the Algonquin people and an important figure for all First Nations people. It is a sad day when our elders pass and he will be remembered by many," Grand Council Chief Patrick Madahbee said in a statement. Commanda was named Officer of the Order of Canada in 2008 for his leadership as an elder and promotion of an intercultural understanding that "raised awareness of the traditions and legacies of Canada's Aboriginal people." In 1990, Commanda joined the Dalai Lama in blessing the Human Rights Monument and also presented Nelson Mandela with an eagle feather in 1998 on behalf of First Nations people. Commanda also received a lifetime achievement award from the National Aboriginal Achievement Awards Foundation in 2010. Commanda spent his life promoting a greater understanding of aboriginal tradition, and bridging the gap between cultures. He also fought for the preservation of land sacred to his people. At the same time he fought to preserve Algonquin language and traditions his niece Annie Smith-St. George said. "He was the keeper of the wampum belt, and teacher of the wampum belt, and he passed on a lot of culture to the people," she said. To the people he knew and influenced, he was known simply as "Grandfather." As a young drummer, Grant Tysick, chief of Kinounchepirini First Nation, began attending Commanda's annual "Circle of All Nations" gatherings near Maniwaki. It was there that he realized the influence that Commanda had on people around the world. "He had not only an influence on young Algonquins, he had a very big influence on young people from all around the world who come to his gatherings every year." Commanda's funeral vigil will begin Wednesday evening and he will be buried Friday. This year's Circle of All Nations gathering, set for this weekend, will also go ahead as planned.